Chinese New Year - for kids! Welcoming the Year of the Pig in 2019! Of all the Chinese festivals, Chinese New Year is for kids of all ages the most loved and anticipated. In China, planes, trains, buses, boats, donkeys, and any means of transportation you can imagine, are jammed packed with people returning home to enjoy the celebrations with their friends and family. And all over the world, wherever there is a Chinatown, the festivities are a colorful display of dragon dances, lantern festivals, feasts, and of course firecrackers! In western countries, New Year's Day always falls on January 1st. In China, New Year's Day is also the first day of the first month of the Lunar Calendar! Therefore, Chinese New Year dates vary each year and could fall at the end of January or in February. The New Year celebrations begin on New Year's Eve, the big party is on New Year's Day, and the action continues for the next 15 days. It all ends with the first full moon of the year, fifteen days later with the Lantern Festival, another great carnival and the perfect ending to this great holiday season. As per long-standing Chinese customs, each year is assigned an animal according to the Chinese Zodiac. Click here to learn more about the Chinese Zodiac and the animal that corresponds to the year you were born. The Preparations: This is the most important of holidays for Chinese, preparations start a couple of weeks before the big day: House-cleaning, putting away knives, paying respects to the ancestors, preparing the feast, making decorations... 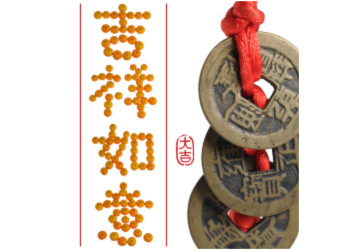 So many superstitions and traditions to get ready for the new year!. The Celebrations: At home, kids anxiously await the coming of the new year. This is a time for family gatherings and the biggest feast of the year. Kids look forward to their lucky red envelopes and setting off firecrackers. 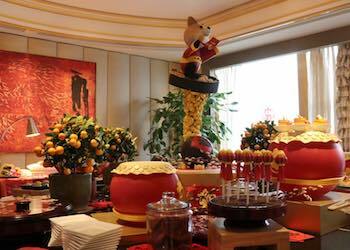 Learn more about the celebrations and the "lucky foods" for the New Year's banquet. 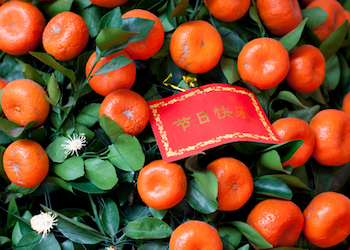 No Christmas Tree like we have in the West, but instead, Chinese decorate the house with mandarin trees for good luck, which by the way, also make good presents if you are visiting someone. Instead of Santa Claus and presents, Chinese children get the lucky and shiny Red Envelopes, which contain money. The Dragon Dance Parade brings good luck and prosperity for the coming year and is an essential ingredient of any Chinese celebration, specially the Lunar New Year. The Dragon Dances begin on New Year's Day, and continue throughout the festivities for the next fifteen days. A cloth dragon is held on poles by a team of a dozen or more members who make the dragon "dance" by raising and lowering the poles. 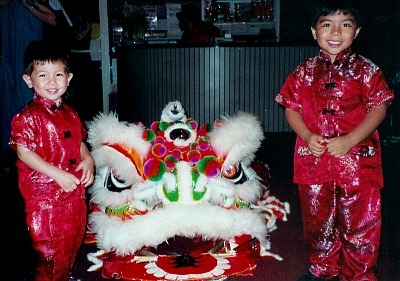 Here's more on the Chinese Dragon Dance, videos, costumes and more. The Chinese Lion Dance is often mixed up with the Chinese Dragon Dance. The Dragon Dance is performed by a team of ten or more dancers, whereas the Lion Dance team consists of only two. The Lion Dancers perform to the sound of drums for the first three to five days of the New Year. They dance in front of stores and businesses to scare off the evil spirits and to bring good luck to everyone. Here's more on Chinese Lion Dances, videos, pictures, costumes, music to perform your own Lion Dance! Lavish Fireworks Displays are a staple of a Chinese New Year celebration. All cities accross China will put on their best, after all, this is the country that invented them. If you happen to be in China during this time, or in any big city with a large Chinese population, don't miss them! One of the most lavish displays in what has to be one of the most breathtaking settings takes place in Hong Kong's Victoria Harbour, check it out on our sister site here. Make a Chinese New Year Lantern: Red balloon lanterns decorate every corner of the city during this marvelous time. We teach you how to make your own so you can hang or place anywhere to brighten up a few little corners. 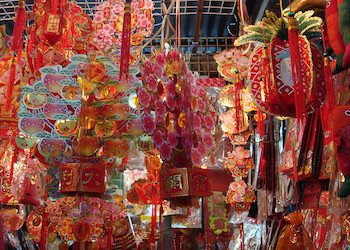 More Crafts for the Spring Festival: Some more crafts and activities for the New Year, make your own red envelopes, learn how to write Chinese New Year greetings, make a paper fan, firecrackers, and many more shapes of lanterns. Chinese New Year Dragon: This gorgeous paper dragon, in bright red and gold, the lucky Chinese colors to bring a touch of good fortune and wealth to your home! What are some common Chinese New Year Greetings? How do you wish someone a Happy New Year in Chinese? Here are some of the most common phrases and sayings during this most important of holidays. What are the typical ornaments for the Spring Festival? Instead of shiny red Christmas balls we have shiny red lanterns... orange and mandarin trees replace the Christmas tree... Holly leaves and red berries? Try plum blossoms instead! 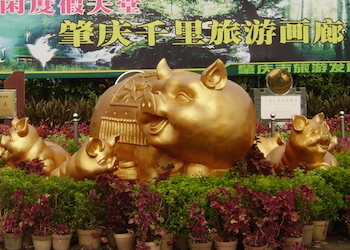 The 12 Chinese New Year Animals What is this year's Chinese New Year Animal? What do these animals represent? There are twelve Chinese New Year Animals according to the Chinese Zodiac, each with its own characteristics. This is a great time if you happen to be in China. Just beware that traveling during and around these times is very difficult and planning ahead is essential. Send a FREE Chinese New Year e-Card! It's easy and it's free! Choose from more than 60 great designs, customize and personalize your greeting. Here's a short Chinese New Year clip from the celebrations in China, click on the arrow to play! Chinese and Asian communities all around the world get together and celebrate the most important of festivals. The parades, the fairs, the lion dances, the fireworks displays... These places all around the world really go all out to celebrate the Chinese New Year. Here's what, when and where is happening this year. If you have a chance to visit any of these cities you really are in for a smashing event!